Read more in this ESO press release. The cosmic weather report, as illustrated in this artist’s concept, calls for condensing clouds of cold molecular gas around the Abell 2597 Brightest Cluster Galaxy. The clouds condense out of the hot, ionised gas that suffuses the space between the galaxies in this cluster. 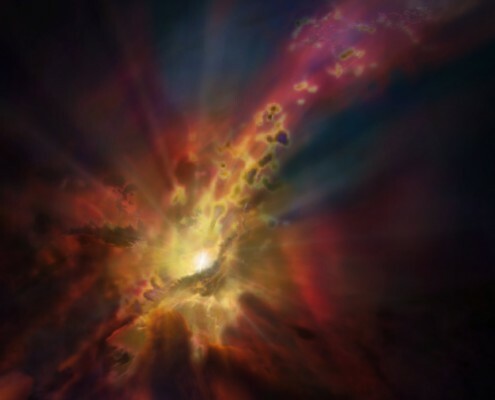 New ALMA data show that these clouds are raining in on the galaxy, plunging toward the supermassive black hole at its centre.